The 2008 Great Reading Adventure has now officially ended. This website will remain live for the foreseeable future but will no longer be updated. For 2008 a 200 page graphic-style history of the city was specially commissioned from local author Eugene Byrne with illustrations by Simon Gurr. Eugene and Simon created a highly acclaimed graphic biography of Isambard Kingdom Brunel as part of the Brunel 200 celebrations in 2006. Thousands of copies of The Bristol Story were distributed free of charge, to schools and colleges, libraries, reading groups, the business community and members of the public. The Great Reading Adventure started in 2003 with a citywide reading of Treasure Island. The project is now a well established part of Bristol's cultural calendar. Each year's book is either set in Bristol, is by a Bristol author or is about issues that are of interest to people in Bristol. • Develop standards of literacy through the promotion of reading. • Stimulate new forms of creativity inspired by the reading experience. • Use reading to facilitate learning about the past. • Bring diverse communities together through the act of reading and thereby foster a sense of shared identity. This website provides downloads of the illustrated guide that has been produced as part of the project, as well as more detailed background information on the topics raised by the book and guide. It also contains news of activities that took place. In addition the website was used to encourage people to submit their own personal stories of living in Bristol and to share urban myths about the city. See My Bristol for some of the contributions received and Education for a showcase of work that has taken place in schools and other centres of learning. Some of the documents on this page require Adobe Acrobat. Download this for free here. Read the official evaluation report for the 2008 Great Reading Adventure here in PDF or Word format. Download the Bristol Timeline from the illustrated guide here. 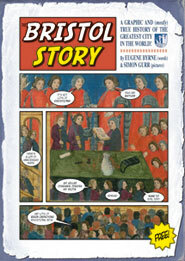 Simon Gurr will be signing copies of The Bristol Story at the American Stand at Comic Expo on 12 May, 2.00-3.00pm.